Sister The Nghiem (Sister True Vow), currently the abbess of White Crane Hamlet at Blue Cliff Monastery, is a second-generation Vietnamese-American who grew up in Pennsylvania. She is one of the pioneers of Blue Cliff Monastery, helping to guide its transformation from a family holiday resort into a mindfulness practice center. As a musician, she has composed several chants and songs since becoming a nun. She has a deep interest in Buddhist psychology and its connection with Western psychology, merging the two to help people heal and touch their fullest potential. 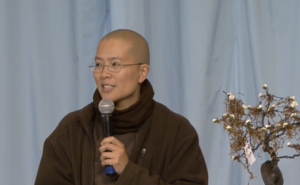 Join her this Fall for the Awakening Together Tour with the Thich Nhat Hanh community.